Non-alcoholic fatty liver disease develops when fat accumulates in the liver. This can occur in individuals who don’t drink alcohol or who drink in moderation. In some people, non-alcoholic fatty liver disease (NAFLD) causes no symptoms or complications. However, if it progresses, it can ultimately lead to liver failure. If you’re diabetic you should also be concerned about your liver health. Diabetes can put a person at an increased risk for non-alcoholic fatty liver disease. The Mayo Clinic reports that at least half of diabetics with type 2 diabetes will develop non-alcoholic fatty liver disease. Other contributing factors of non-alcoholic liver disease include being overweight, high cholesterol, and high blood pressure. Although diabetes may contribute to non-alcoholic fatty liver disease, the association works the other way around, too, meaning NAFLD can lead to the diagnosis of diabetes. If diabetes is poorly managed, non-alcoholic fatty liver disease can worsen. Liver fibrosis occurs when scarring or damage occurs to the liver. Non-alcoholic fatty liver disease can contribute to liver fibrosis as it can lead to inflammation and scars on the liver. In a healthy individual, the liver is able to heal and repair itself. In a person with other medical conditions or who is overweight, the liver’s ability to heal and repair itself diminishes, leaving permanent scarring – liver fibrosis. Liver fibrosis can worsen to the point where the liver is unable to perform its functions. This can also lead to alternative conditions like liver failure, liver cancer, and portal hypertension. Liver fibrosis can be brought on by chronic liver diseases, such as hepatitis B and C, alcoholic liver disease, and non-alcoholic liver fatty liver disease. Liver fibrosis can be confused with cirrhosis, an entirely different condition. Cirrhosis is caused by liver fibrosis, and when liver fibrosis occurs, the liver structures are still intact. After cirrhosis, the liver structure becomes deformed and can begin to collapse. Reversal is possible at the stage of liver fibrosis, but it is practically impossible at the cirrhosis stage. New research has uncovered that fatty liver and diabetes influence fibrosis. Furthermore, the risk for liver fibrosis increases five-fold with a fatty liver disease and diabetes diagnosis. The findings were published in Hepatology. Abdominal ultrasounds and elastography to scan the liver were performed on 3041 Dutch adults. Blood samples, anthropometric measurements, demographic data, medical histories, comorbid conditions, smoking history, drug use, and alcohol consumption were all accounted for as well. About 35.5 percent of participants had steatosis – the presence of fat in the liver cells. With each additional decade of age, the risk of fibrosis increased, with incidences of 1.4 percent for those between 50 and 60, 3.4 percent for those 60 to 70, 5.5 percent for those 70 to 80 years old, and 9.9 percent in those 80 years and older. 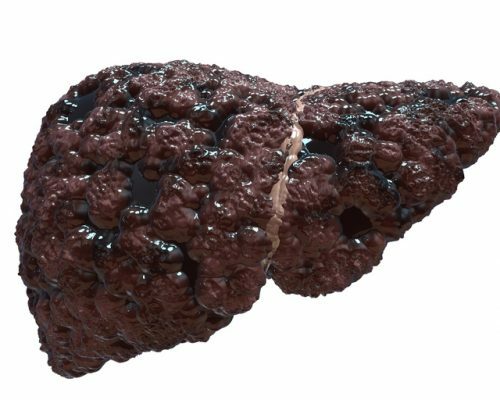 The largest fibrosis risk was seen in those with hepatitis B or C combined with diabetes and fatty liver. Researchers note that their findings do not automatically translate to Americans, as Dutch people are generally thinner. Estimates suggest 60 million Americans have non-alcoholic fatty liver disease. Lose weight and exercise – fat can penetrate liver cells, causing a fatty liver and contributing to liver fibrosis. Improve diet – not only will a healthy diet help you lose weight, but the foods we eat can promote a healthy liver as well. Opt for foods that work with your liver and won’t make your liver work harder. Red meat, for example, is hard to break down so you may wish to limit your intake. Stick to one glass of wine – although alcohol is usually to blame for many liver conditions, sticking with one glass of wine can work to prevent a fatty liver, according to research from the University of California – San Diego School of Medicine. Treat other medical conditions – diabetes, hypertension, and high cholesterol which can all contribute to fatty liver. By managing other conditions, watching what you eat, and getting in exercise, you can ensure your liver stays healthy and continues to perform its multiple functions. This way, you can also lower your risk of fatty liver and ultimately liver failure.